Teenagers are far more likely to spend their time on social media and gaming after school than they are to be doing homework, according to new data gathered from around 3,500 teenagers in the UK. The teenagers, whose lives have been closely followed from birth by the Millennium Cohort Study, run by the Centre for Longitudinal Studies (CLS), were asked to keep a detailed time use diary for one weekday and one weekend day. The data, which the teens recorded either via a smartphone app or online, has shed new light on how young people spend their time. Around half of the teens surveyed reported spending some time on social media on a weekday. This proportion was considerably higher for girls at six in ten (61%), compared to 39 per cent among boys. One in ten teenagers who reported being on social media had spent upwards of three hours a day online, though the average time spent was 1 hour 21 minutes per day. For boys, gaming was an even more popular pastime than social media; almost half (48%) of all boys had spent time on video games, and of these, 12 per cent reported spending in excess of five hours a day gaming. Just one in ten girls had notched up any time at all on video games. By comparison, the teenagers’ diaries revealed that just 40 per cent did homework on an average weekday, and that boys were significantly less likely to than their female peers – 35 per cent of boys compared to 44 per cent of girls. Those who did do homework, spent an average of 1 hour 13 minutes doing it. The researchers at CLS, based at the UCL Institute of Education, found some other striking gender differences. Teenage girls spent about 27 minutes more time on average on a weekday getting ready (a total of 1 hour 12 minutes on average) compared to their male peers. Girls were also much more likely to help out around the house, with 31 per cent reporting doing chores at home on a weekday, compared to just 19 per cent of their male peers. And while, overall, very few teenagers spent any time reading in their spare time (just one in ten), this was significantly more popular as a pastime for girls. But when it came to sports and other physical activity outside of school, these were more common among boys; 46 per cent of teenage boys had recorded these in their weekday diaries, compared to 39 per cent of girls. However, sedentary forms of entertainment, including watching TV, playing video games and listening to music, were collectively far more popular than sport for both genders. 72 per cent of all teens spent on average just over two and a half hours per day on these sedentary types of activities. These figures may be of some concern, particularly when considered alongside the high levels of obesity among this age group. Professor Emla Fitzsimons, Principal Investigator of the Millennium Cohort Study, said: “These findings provide unparalleled insight into how young people in the UK spend their time. Not only that, but combined with other information we have collected from this group through our surveys, there is now enormous potential to better understand how different aspects of teenagers’ lives fit together. 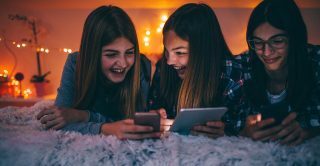 “For example, is there a relationship between girls’ use of social media and their mental health? Does the popularity of social media and gaming play any part in the obesity crisis among young people? For more data from the teenagers’ time use diaries, see this table. 1. The Millennium Cohort Study has been following the lives of around 19,000 young people born across the UK in 2000-01, building a uniquely detailed portrait of the children of the new century. For more information about the study, see www.cls.ioe.ac.uk. 2. The last survey of the Millennium Cohort Study took place in 2015-16 when participants were 14. Around 12,000 participants took part in this survey which collected data on a range of themes. To read the initial findings from this survey, see the CLS website. 3. As part of the age 14 survey, participants were asked to complete a time use diary for two days (one weekday and one weekend day). The days were selected at random for them. Top line data from these diaries is collated in this table. The figures cited in this press release are based on the teenagers’ activities on weekdays excluding school holidays. 4. All the anonymised time use data collected from the teenagers is now available to researchers via the UK Data Service. 5. The Millennium Cohort Study is managed by CLS at the UCL Institute of Education and is funded by the Economic and Social Research Council and a consortium of government departments. 6. The UCL Institute of Education is a world-leading centre for research and teaching in education and social science, ranked number one for education worldwide in the 2014, 2015, 2016 and 2017 QS World University Rankings. It was awarded the Queen’s Anniversary Prize in 2016. In 2014, the IOE secured ‘outstanding’ grades from Ofsted on every criterion for its initial teacher training, across primary, secondary and further education programmes. In the most recent Research Excellence Framework assessment of university research, the IOE was top for ‘research power’ (GPA multiplied by the size of the entry) in education. Founded in 1902, the Institute currently has more than 8,000 students and 800 staff. In December 2014 it became a single-faculty school of UCL, called the UCL Institute of Education. For more information, see www.ucl.ac.uk/ioe. 7. UCL was founded in 1826. It was the first English university established after Oxford and Cambridge, the first to open up university education to those previously excluded from it, and the first to provide systematic teaching of law, architecture and medicine. It is among the world’s top universities, as reflected by performance in a range of international rankings and tables. UCL currently has over 39,000 students from 150 countries and over 12,500 staff. Its annual income is more than £1 billion. For more information, see www.ucl.ac.uk, follow @uclnews, and watch YouTube.com/UCLTV. 8. The Economic and Social Research Council (ESRC) is the UK’s largest funder of research on the social and economic questions facing us today. It supports the development and training of the UK’s future social scientists and also funds major studies that provide the infrastructure for research. ESRC-funded research informs policymakers and practitioners and helps make businesses, voluntary bodies and other organisations more effective. The ESRC also works collaboratively with six other UK research councils and Innovate UK to fund cross-disciplinary research and innovation addressing major societal challenges. The ESRC is an independent organisation, established by Royal Charter in 1965, and funded mainly by the Government. For more information, see www.esrc.ukri.org.